1. It will act as a good partner for your dog, protecting the paws against hurt from sidewalks, asphalt, grass etc. 2.The sole is sturdy, flexible, skid-resistant and allows the boots to be used indoors or outdoors, in wet and dry, hot and cold conditions. 3.The boots are sturdy enough to withstand outside play, and protect your dog's paws from stones, dirt and mud. 4.Wide split seam top opening which makes very easy and quick to put on the dog shoe. 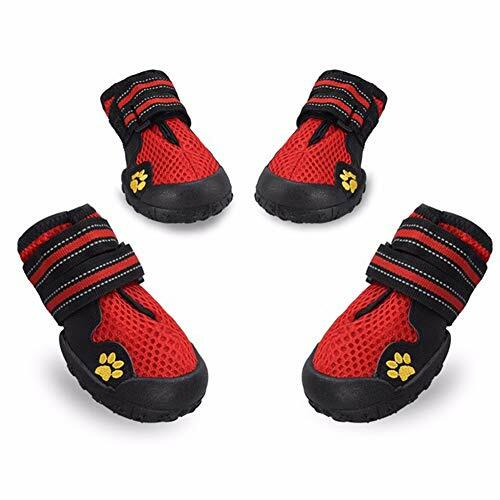 5.Shoes are fastened firmly by 2 Velcro straps, which are long and adjustable, capable to prevent slipping off and supply a customized tightness for secure closure.